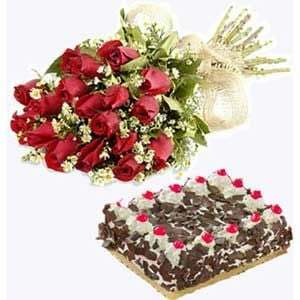 A combo of a bunch of 12 exotic Dutch Red Roses and delicious 1 kg Black Forest Cake with seasonal ferns n fillers. A refreshing way to express that you still love and care, with 12 passionate Red long-stemmed Roses wrapped in a beautiful bow tied hand bouquet. When words are not enough, these bouquet will express your devotion and love with a mild and sweet fragrance.